This is a return customer. Originally, he had asked us to translate the phrase "Way of Inner Strength" into Japanese. My wife ultimately came up with this translation. Seishin is spirit or the inner soul and Ryoku is another reading for strength or power. These beautiful scrolls are given as gifts I think. The cloth is a Silk with a very meditative pattern. 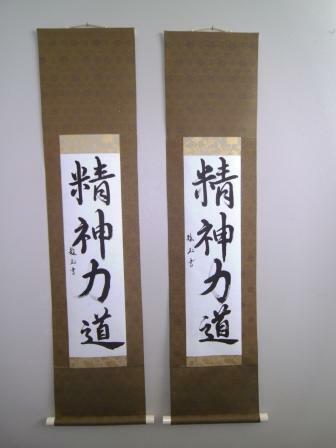 It is written in the Gyousho (Semi-cursive) style by Ryugyoku (Yoshimi Yamada Maples). I am very proud of the work she has done for me. Her writing is always consistent and brush strokes are always technically sound, even when there are multiple orders of the same saying or calligraphy. 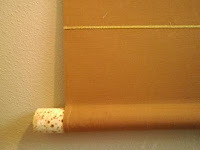 The scrolls are finished with an ivory plastic jikusaki and usu kincha (gold) hanging string. I made this scroll for a martial artist that was providing gifts for those who helped train with him through his dan testing. It reads 友人 which means friend. This is not written by Yoshimi Yamada Maples, but artist Natsuko Horinouchi, based in Germany. 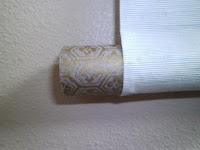 The color of the cloth is bone white with a deep gold on gold Ichimonji with a small karakusa (arabesque). The scroll is completed with an ivory plastic jikusaki and a light gold (usukincha) hanging string. Jonathan--my scrolls are beautiful. I'm very pleased. One I put up immediately, one is for my son's birthday. Thank you. This scroll is so large I am not tall enough, nor have a longer Yahazu to hang it any higher. Unfortunately this gets the unsightly handrail in the way. I love this painting...it is very simple yet complex at the same time. The brush strokes are also light and not as heavy as expected, yet detailed at the same time. This is the seventh in the series by Dee Teller, and if you would like to purchase her art go to http://deeteller.com/. I chose the green cloth for the scroll with a very light gold pattern to match the theme of the tree as if in spring or summer. The gold Karakusa (arabesque) on white background provides a good relief. 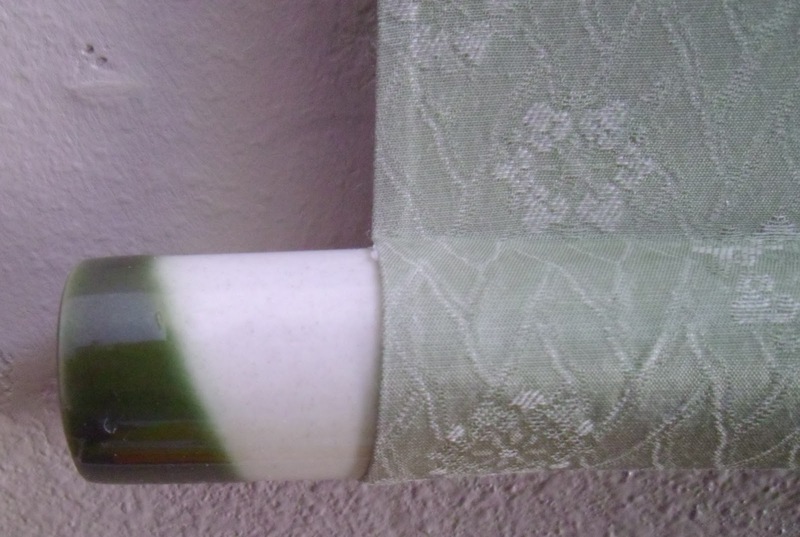 The Jikusaki, are a Ceramic cream and green two tone which seems to go well with both the cloth and the Ichimonji. This is the second scroll order with the Koi cloth scroll. 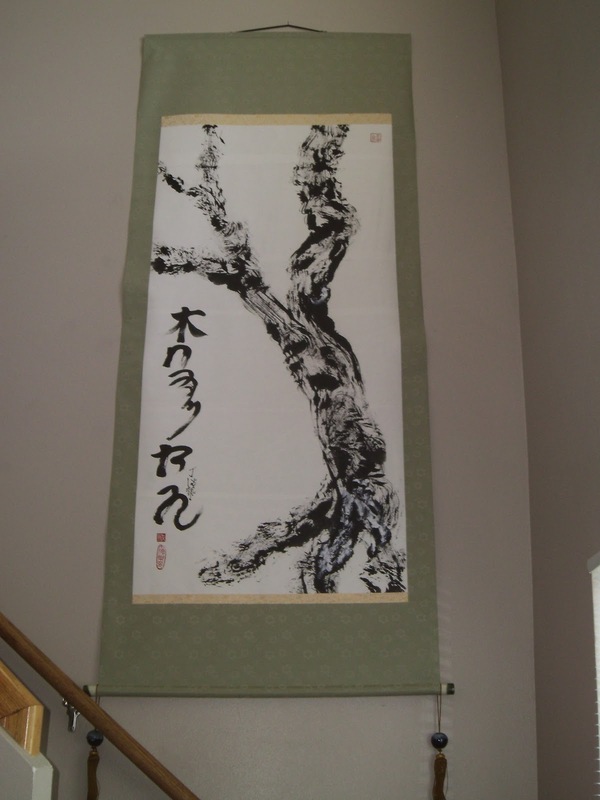 The reason for the more traditional nature of this scroll is that it is meant to hang in a dojo for Kenjutsu. 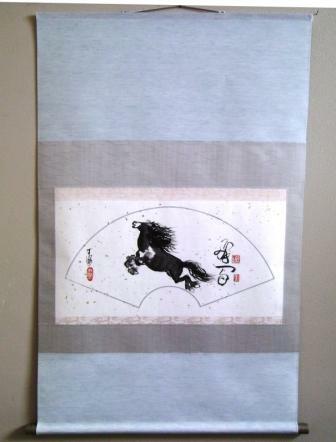 It is done in an Antique color silk with a rosewood jikusaki and Kodai Hanging String. It is written in the Gyousho, semi-cursive style by Yoshimi Yamada Maples. This is a beautiful scroll with an unorthodox cloth. The characters read Mushin or Empty Mind. This concept is taught deeply in Martial Arts and Buddhism. It is written in the Gyousho style by Yoshimi Yamada Maples. The mixture of red hanging string and Jikusaki set against the black cloth is very georgeous. This scroll titled Color from the Garden, is the 6th in Dee Teller's series of works being prepared for an exhibition. She is a very talented artist who has taught in China. 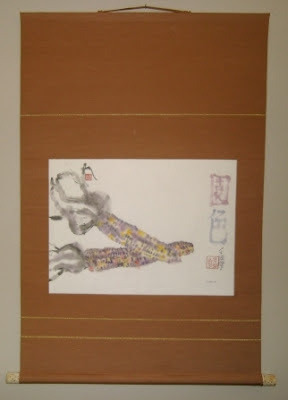 The two characters are represented in the painting with Garden 園 En in Japanese and Color 色 Iro. When I first saw this sumie, my first thought was to the Autumn season and the colors of the Maize or indian corn. I wanted to stay true to that so I used the light brown cloth or kireji with the gold suji in order to emphasize the feeling of Fall to the viewer. 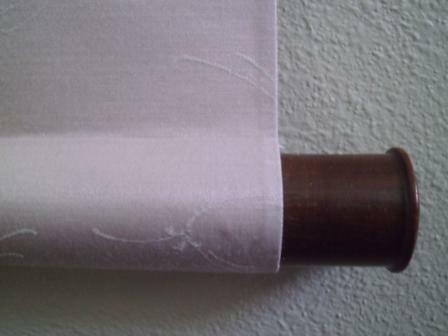 Suji are the lines of cloth attached to the fabric of the scroll. The speckled ceramic Jikusaki is a nice break from the complete solid of the informal Fukuro Hyougu scroll style. 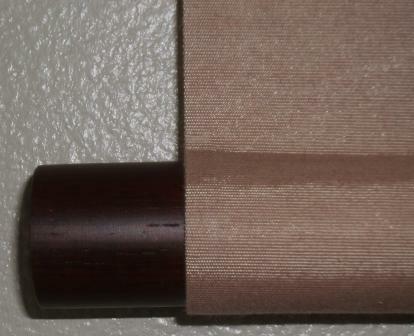 I used the Kincha color which is similar to this brown for the hanging string. This is the fifth scroll in a series by Dee Teller. Her writing and work is very fluid and beautiful. This is titled Spirit Woman, and the second character is definitely easy to read as woman or onna in Japanese 女. The first character is in a Full cursive, and I need to confirm with the artist what the characters are. This is the fourth of the wallscrolls by Dee Teller. It is a calligraphy piece titled Art. Most likely the character seems to be 芸. This beautiful work is done in a Nidan Hyougu style. 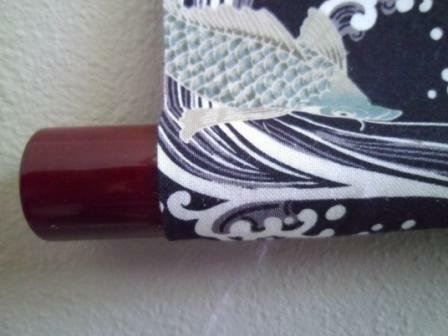 The Chuumawashi is a pure silk, with a beautiful flower Karakusa. For the Ten & Chi I selected a dark sage silk that has a rough finish. 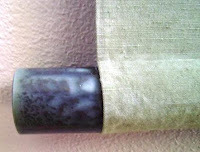 The scroll is completed with a Green Kakehimo and a slate colored ceramic jikusaki. This is the third painting in a group of works by Dee Teller. 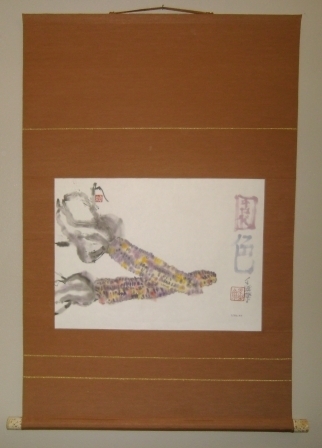 The piece is titled "Sing from the Heart" and the second character is definitely read 心 (Kokoro in Japanese). If in a literal translation then the first character could be 歌...but I have not yet confirmed this with the painter. 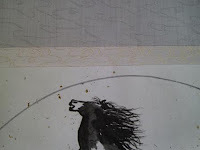 In designing the works, Dee said to me she wanted to avoid the earth tones common with the Japanese scrolls. This white cloth is definitely more Chinese in feel, but not in the arabesque pattern of the cloth. I chose to do this in the 3 step style, or Sandan Hyougu 三段表具. The white cloth is unassuming and tends to push the artwork forward to the eye of the viewer. The blue is a cool color used to evoke serenity and joy to fit with the message of the calligraphy. The scrolls is completed with the Shibucha Jikusaki, which is a little bit deeper brown than the rosewood stain and the Takuboku Hanging string which is white with Green accents. This is the second in the series of paintings mounted for Dee Teller and her upcoming exhibition. http://deeteller.com/ This work is titled "Flower Dance". The most challenging point in designing this scroll was to find a cloth (Kireji) that would let the work be dominant, but still help accentuate the yellows and the purple in the painting. This lilac colored cloth with a wispy pattern really seemed to do the trick. 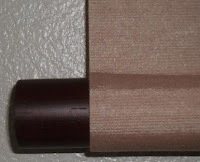 It is completed with an Enshu Shitan Jikusaki (Rosewood, with a lip at the end) and the Fuji color hanging string. 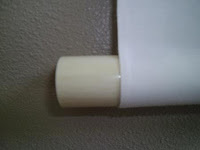 Total size of the scroll is a little more than 14 inches wide by 46.3 inches long. This painting was drawn by Dee Teller. You can see her body of work at http://deeteller.com/ When she proposed this work to be put into a scroll, I spent all day trying to think of some ideas of what would complement the title of the work "Flying Horse". This is part of a series of 13 paintings that are being prepared for an exhibition. In my mind I wanted to put two symbols into the kakejiku. The first was sky and the other was water. The cloth for the sky was easy to select, but I took time to find the right water themed patterns in the Ichimonji and the the Chuumawashi. 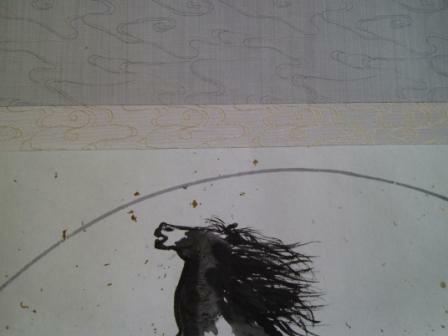 (Gold and Grey cloths respectively) It is finished with a Wajiku Jikusaki. It is very sad, but I was informed by my supplier that this company went out of business, and this was the last Jikusaki of this kind that they had in stock. It is very beautiful, and I am sad that I can no longer have the option to use these when designing a scroll. I also selected the grey (nezumi iro) colored hanging string for this scroll.